← The Elephant Man lives. Well we’ve had a couple of fun days. I just asked Mike to remind me of yesterday’s itinerary. Apparently we walked and walked and walked. Although his tone doesn’t suggest it, he enjoyed being dragged by foot around the city. 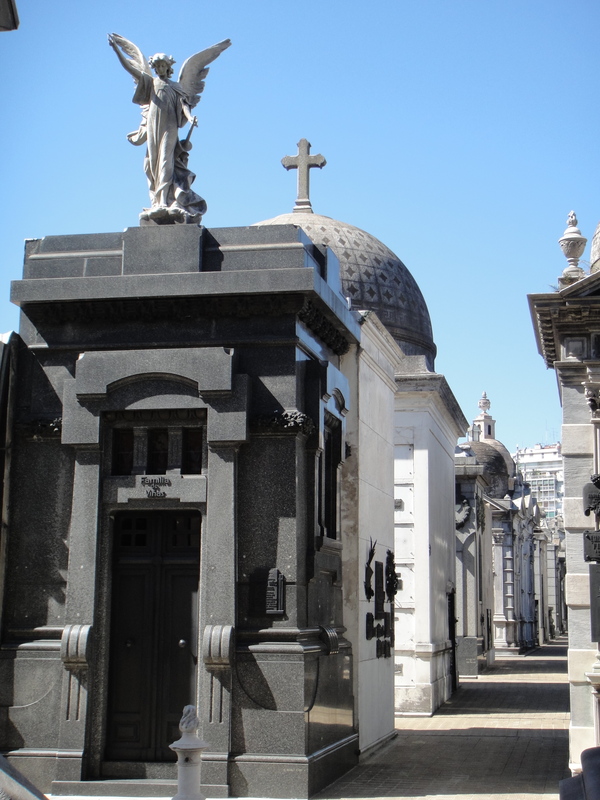 We walked to Recoleta Cemetery. An odd tourist destination, you may comment. But this cemetery is some of the most expensive real estate in Buenos Aires. Once you are laid to rest, your family pays for the privilege for eternity, yearly rents are pricey, god knows what happens if you’re evicted. 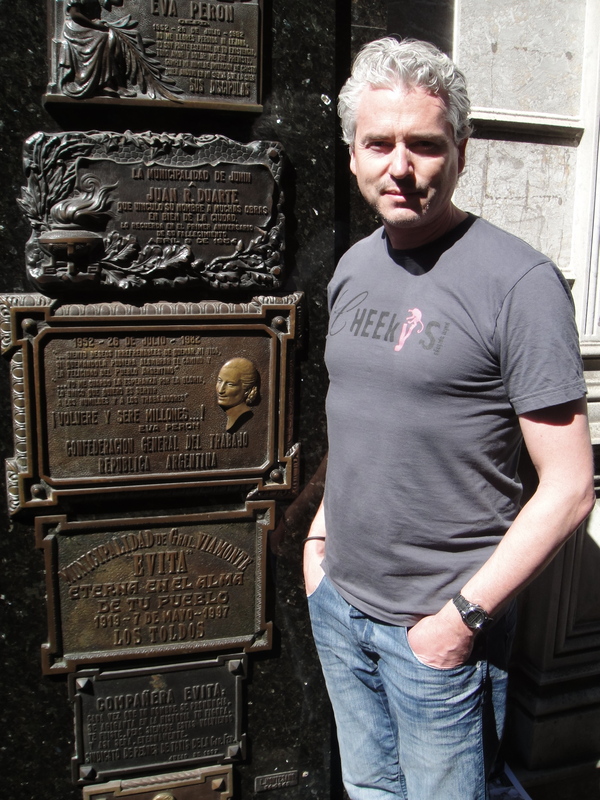 In fact, Recoleta is the final resting place for Evita – and I do mean ‘final’, as the story of the journey of her mortal remains subsequent to her death in Europe is quite remarkable. These crypts are stacked with coffins three storeys down, each crypt designed by an architect and artist, the most beautiful designs from art deco to modernist and crammed cheek by jowl. We fitted in a tour of an art gallery, a picnic on a traffic island (lawn in a sea of city!) and then the long (5km) walk back to San Telmo (honestly, it didn’t look that far on the map!). Today was more leisurely; breakfast in a cafe and then a trip on the Subte (subway) to Palermo (Cottesloe, or Yorkdale for you Canadians). Unfortunately on that Subte ride Mike was robbed. A $450 pair of sunglasses. Crowded train and light-fingered man. Mike knew instantly that his glasses had been stolen but couldn’t work out who the thief was amongst the people crammed against him. Oh well, he has a spare pair, we have insurance and now he can get a new pair. Eleven years of traveling together and that is the first time we’ve been pick-pocketed, which isn’t bad odds really. So now we are looking out for a gypsy in Prada sunglasses. Palermo was a great relief from that experience: retail therapy. Wandering the boutiques with the very rich and very glamorous, god I love the exchange rate in this country (I think I may have mentioned that previously!). The streets and cafes hold a mixture of private school girls, chic old ladies and dog walkers (the record to date is eleven dogs to one walker). It may sound like a great suburb, but the streets are still covered in caca. We fly off to Mendoza tomorrow to experience the wineries and maybe the Andes close up. So signing off so we can walk off dinner, walking around the closest piazza before bed. 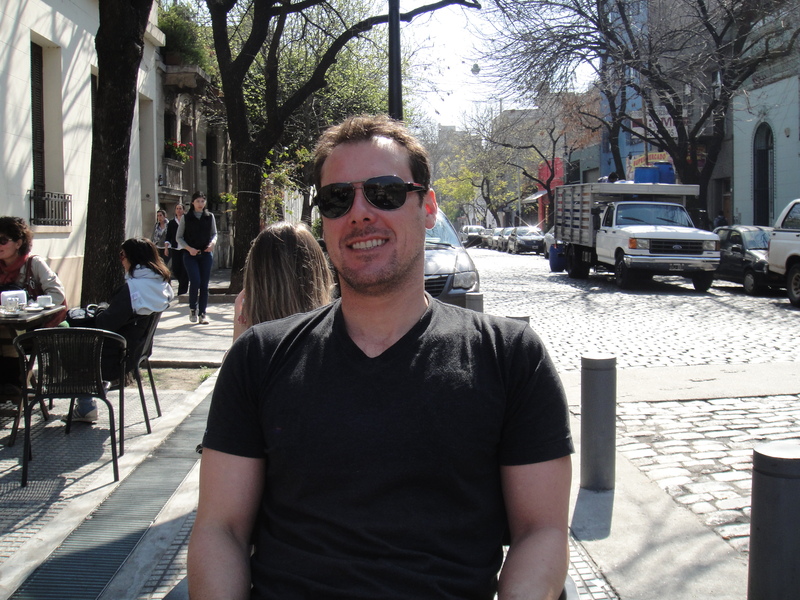 This entry was posted in Argentina and tagged Buenos Aires, Evita, Recoleta. Bookmark the permalink.